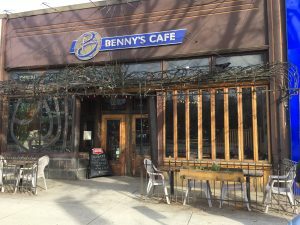 Last summer, I wrote a blog entry about Benny’s. A few months later, I learned that the property was slated for “development”, with a projected closing date at the end of August, 2018. I started to try out material at their Thursday evening comedy open mic, knowing the opportunity would end soon. I did my first open mic here only four weeks ago. Now I hear the place is closing earlier than expected. I hope it isn’t something I said. I usually do self-deprecating humour, but this situation calls for a rant. Friends tell me I’m brave to stand here and do comedy. I put the risk involved in doing a four-minute set here in perspective. Not long from now, a wrecking ball will start swinging around and wipe anyone, and anything in its path to kingdom come. I’m taking this whole thing pretty hard. I’m often in the neighbourhood because I use the community centre up the street. When I discovered great soup and a bagel for $5.25, Benny’s became my go-to spot for lunch. When I want to connect with a friend for coffee after our program, it’s been, “Let’s go to Benny’s,” for the past three years. Something has changed. It sure hasn’t been Benny’s. 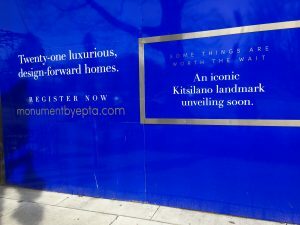 Who came up with that brilliant slogan on the sign next door: “An iconic Kitsilano landmark unveiling soon”? I’ll bet the culprit was some snotty-nosed, artsy-fartsy, whiz-kid from Trana. I can’t believe a Vancouver-based advertising firm would have the gall to rub it in our faces like that. What is going to become of all the artefacts like that stained glass of Jesus smoking a joint? I hope it goes to a good home. I mean, some things are sacred! And, where I am I going to bring my Ontario friends when they visit to show them a slice of life in the real Vancouver? This entry was posted in Writing and tagged development, stand-up on April 27, 2018 by Wilda.